There are ethics in medicine, law and construction? If you offer help then help. GENSrate is the first site dedicated to making correct decisions on GCs. No longer wonder who to do business with. Know who to do business with. GCs far too often play games with your money, your company and your sanity. They can play hard, fast and loose. Sometimes a GC and success on a job is as much a factor of the PM on a job as it is the GC overall. GENdex will capture the different factors and create profit profiles based on the company as well as significant personnel on a particular job. Based on the performance of a GC on different factors the GENdex helps guide your bid to a better, more profitable outcome. 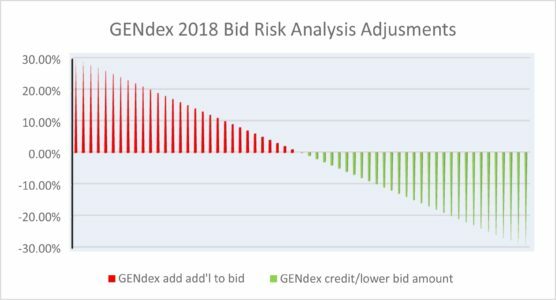 The + side in red shows how much to add to your base bid and the – green side shows how much you could discount your bid and still have a profitable job.